Dad of eight Shaun Duffield and his family enjoying his new ultrafast broadband connection. Engineers Danny Parkin and Dave Scargill (back row) helped connect up Shaun’s Leeds home are at the back of the shot. More than 1.2 million homes and businesses across the country now have access to faster, more reliable and future-proof Fibre-to-the-Premises (FTTP) broadband services over the Openreach network. The milestone, which has been reached just over a year since the digital infrastructure company announced its ‘Fibre First’ build programme, means Openreach is on track to reach three million homes and businesses with ‘full fibre’ broadband by the end of 2020. Since the launch of Openreach’s Fibre First build programme in February last year, its engineers have deployed around 2.6 million kilometres of fibre– enough to travel to the moon and back three times. The massive engineering project has involved a dedicated team of around 2,000 fibre engineers, using hundreds of heavy plant machinery, pole erection units, cherry pickers, mini-diggers, 3,000 spades and a small fleet of drones. To celebrate the one million milestone, the company is funding one year’s free broadband connectivity to the millionth home now able to order over its ‘full fibre’ network. 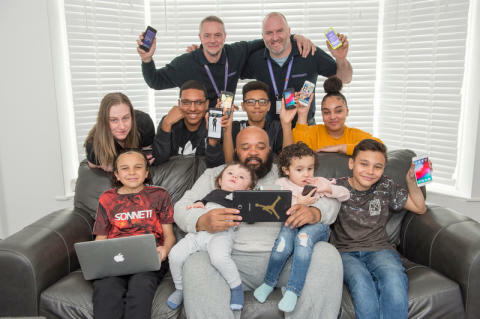 Our engineers broke the news to lucky recipient Shaun Duffield, when they arrived at his home in Leeds to connect him to our network. The delighted dad of eight said; “Getting fibre broadband has made a massive difference already but being able to get it free for a year is brilliant news. Openreach has doubled its FTTP footprint in one year and continues to ramp up the build – making the technology available to more than 14,000 new homes and businesses every week across the UK. Alongside this milestone – Openreach has announced 12 new locations where it will be extending its FTTP network over the next 12 months - with work starting in Stockport and towns and cities across Northern Ireland including Armagh, Bangor, Ballymena, Greater Belfast, Coleraine, Derry-Londonderry, Enniskillen, Lisburn, Larne, Newry and Newtownards. As a result, 38 locations across the UK have now been included in the first phase of Openreach’s multi-million pound Fibre First programme. Openreach’s ambition is to reach 10 million premises by the mid-2020s, and ultimately, the majority of the UK, if the right conditions to invest are in place. The new locations have been published on Openreach’s website – as part of its ongoing commitment to support the Government’s ‘full fibre’ ambitions and strategy, as set out in the Future Telecoms Infrastructure review. Openreach continues to heavily invest in both its network and people to drive is fibre broadband ambitions and has already recruitedclose to 1,400 out of the 3,000 trainee apprentice engineers hires announced in January for this year, having received more than 44,000 applications in just three months. To support the new intake, a new training school will open in Swindon next month – one of 12 new regional fibre training centres. This will support our expansion in Exeter and the West Country; with Salisbury our first city to gain universal access to full fibre. Minister for Digital Margot James said: "The Future Telecoms Infrastructure Review set out our approach to maximising full fibre coverage, and I'm delighted that Openreach has now reached one million homes and businesses. Significant investment like this from network operators is critical to deliver our plans for nationwide coverage, and we're working with industry and Ofcom to create an environment that supports and encourages the commercial rollout of full fibre broadband." Clive Selley, Chief Executive of Openreach, said: “Our full fibre build is speeding ahead and we’re now ready to connect more than a million consumers and businesses if they decide to order from a service provider that’s using our FTTP network. “Since the launch of our build programme last year we’ve made huge progress – honing our skills, tools and techniques, driving our costs down and helping our engineers to go ever further, faster and more efficiently. Last month we announced plans for Salisbury to become the first entire city in the country to have access to our FTTP network – in what is expected to be the fastest city-wide network build in the UK. “But it’s not all about being a fast builder, we’re also keen to encourage fast adoption. We recently launched a consultation with industry to decide how and when we upgrade customers to this new future-proofed digital network. “Ultimately our ambition is to deliver the best possible digital connectivity to everyone, everywhere, across the entire country. I believe the progress we have made to date proves that we’re making good on that promise, but there’s more to do. People interested in upgrading their broadband to new ultrafast services can see if they’re able to connect by entering their postcode into Openreach’s online fibre checker at openreach.co.uk. Openreach will fund the cost of the customer’s chosen FTTP broadband package to include monthly charge inclusive of line rental for one year.